"Happy?? This is new style." 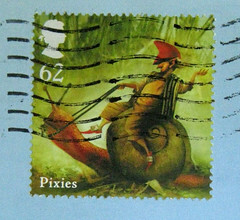 Unfortunately for my friend who sent it, it got returned to him and he sent it again to me in a plain envelope... these foreign envelopes with different positioning of address and name, and return address, can be confusing - I always try to address them closer to USA convention, and hope that will make delivery less problematic. My favorite sweet color... wtf?? And of course we mustn't forget the inside pages. Forgive my clumsy swirling... it's not as elegant now that I'm using Gimp instead of Photoshop, but... it does the trick. Interesting!! I've gotten quite a few letters through with the improper orientation, but I hadn't realized that was an issue. i love stationery like this, especially b/c of the ridiculous phrases that usually have nothing to do with the pictures! Huh. I wonder how it would work if it weren't vertical. 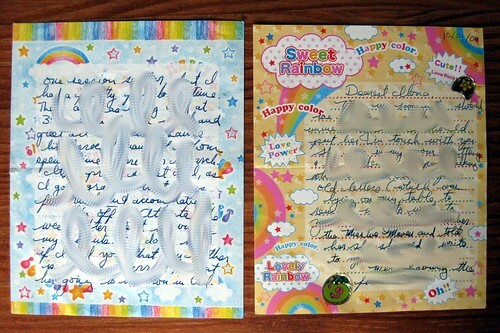 I have a few Japanese envelopes like that, with address, name, and from in that order. I tend to address them the U.S. way because I'm ambivalent about whether I trust the USPS to understand it. Maybe sometime I'll do a test and follow what it says in the envelope. The phrases remind me of engrish.com. Very pretty stationary, though! The little clouds are so cute! 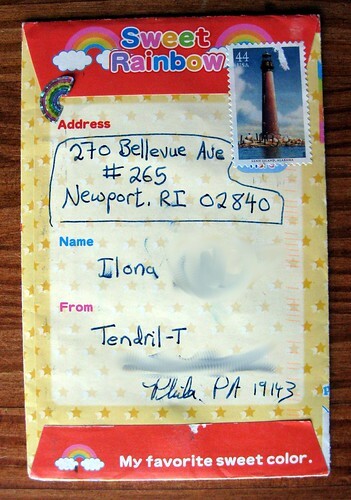 I had a card sent to me with a verticle envelope not long ago on it that had a stamp on it asking for 20 cents. I had wondered what that was all about. I thought maybe because it was a small envelope. But now I am glad the mystery of the extra 20 cents is solved. It had to do with the shape of the envelope and not the small size. 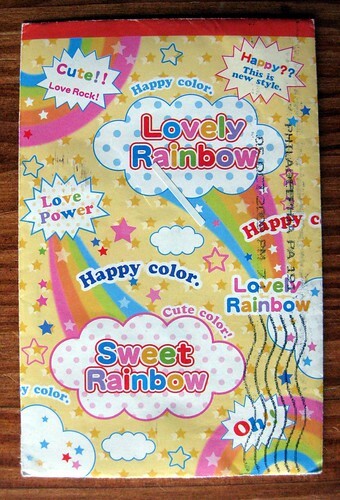 I used to have some stationary like this with the really random English phrases. I bought it when I went to Japan. Unfortunately, I used it all up! Cute though. I know what you mean about GIMP. I'm trying to get used to it as my version of PhotoShop doesn't work with my new computer and VISTA.